Coverage: Watch live on BBC Two Wales, online, tablets, mobiles and BBC Sport app from 18:45 BST; listen on BBC Radio Wales and BBC Radio Cymru; text commentary on BBC Sport website. Defender Chris Gunter says it would be "madness" to let Wales manager Chris Coleman leave the job after Euro 2016. 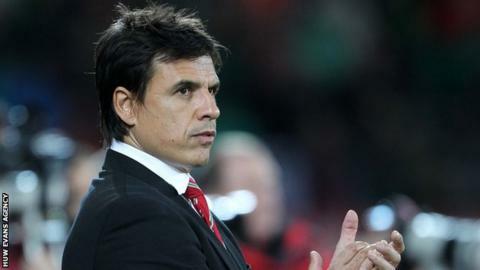 Coleman says he and the Football Association of Wales are currently "apart" in negotiations over a new contract. His deal ends after Euro 2016, the first major tournament Wales have qualified for since the 1958 World Cup. "Every player would be absolutely gutted if he was to leave," said 26-year-old Reading full-back Gunter. "You'd like to think that the FAW are doing all they can to make sure he stays. "I'm sure they are because it would be absolute madness to watch Chris Coleman walk away from our squad. "What he's achieved stands alone, really and it would be crazy if he was to leave us as our manager now because the biggest thing is the respect he has of every single player in the squad. "And that is pretty much the biggest compliment you can pay him." Contract negotiations opened on 15 March, but no further talks between the FAW and their manager are scheduled with Coleman in "game mode" for Wales' friendlies against Northern Ireland and Ukraine. Wales play their penultimate warm-up match before the start of Euro 2016 against Ukraine in Kiev on Monday evening. That follows a 1-1 draw with Northern Ireland on Thursday, when Coleman was without eight players, including key performers Gareth Bale and Aaron Ramsey. Tottenham defender Ben Davies is available for the Ukraine match, and Walsall's Tom Bradshaw could make his debut. But Andrew Crofts is back with Gillingham.